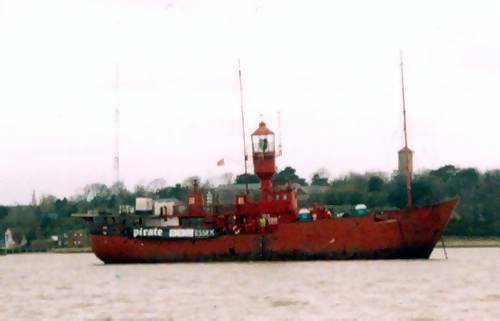 From 10th to 17th April 2004, BBC Essex marked the fortieth anniversary of offshore radio in Britain by launching their own ship-based radio station, Pirate BBC Essex. 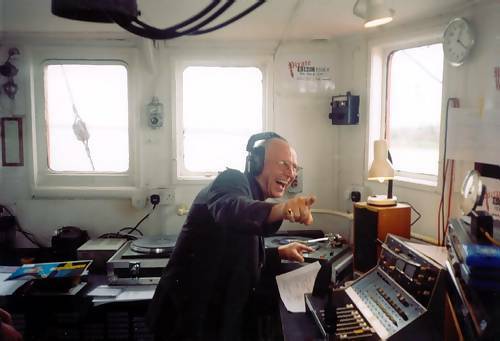 Broadcasting from an old light vessel, the station transmitted sixties music and memories twenty-four hours a day all week. The Pirate Radio Hall of Fame was asked to help the station contact some former offshore broadcasters. We were delighted to help and even more delighted to be invited out to the ship on Easter Saturday, the station's first day on the air. Light Vessel 18, moored in Harwich harbour. After fish and chips, washed down with a refreshing pint in The Pier Hotel (as frequently mentioned on the air back in the sixties when it was a regular over-night stopping place for the DJs), it was off on the tender. Former Caroline disc-jockey Mike Ahern was just leaving the ship as we arrived. Mike Ahern (wearing a life jacket for the transfer, as stipulated by BBC Health & Safety regulations) on the tender. In the foreground of the right hand photo is Tony O'Neil, curator of the National Vintage Wireless and Television Museum in Harwich. The station's disc-jockey line-up combined some of the great broadcasting names of the pirate era with voices familiar to BBC Essex listeners. On Easter Saturday the first on air was Ray Clark. 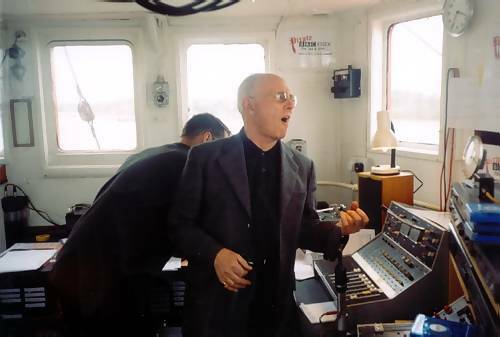 He is currently heard on BBC Essex and BBC Radio Cambridgeshire but, back in the eighties, he was on Radio Caroline where he broadcast as “Mick Williams”. 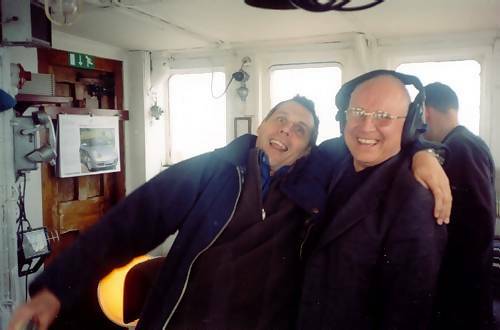 He was followed by Roger Day, Mike Ahern and, by the time we arrived on board, Paul Burnett. Paul Burnett in his “Tony Prince” pose and playing air guitar along to a Chuck Berry record. BBC Essex's Ian Wyatt in the background. Note the turntables and tape cartridges as used in the sixties, although more modern technology like CDs and minidisks were available too. Other former offshore presenters heard on the station were Pete Brady, Tom Edwards, Ian Damon, Duncan Johnson and, presenting the weekday programmes, Dave Cash and Keith Skues. Visiting on Saturday, although not taking part, was Paul's old colleague from Radio 270 and Radio Luxembourg, Mark Wesley). Mark joins Paul Burnett in the studio. Back in the bar, Mark and Paul with another former Radio 270 colleague, Roger Scott (centre). 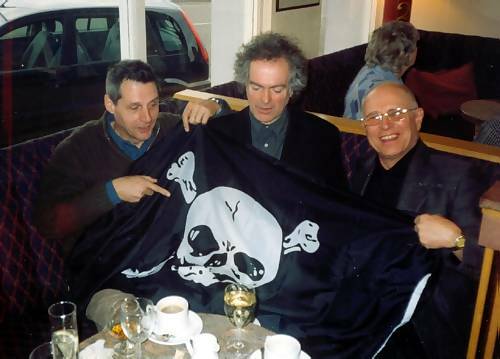 The skull and crossbones flag in the right hand picture was supplied by Chris and Mary Payne of Radio London. Check out their website for more photographs. 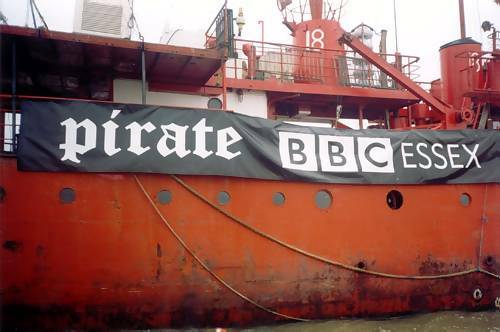 Pirate BBC Essex was a huge success with emails, text messages and phone calls flooding in from all over the world. The disc-jockeys all sounded like they were having a great time and the listeners certainly did. Duncan Johnson was a guest on Pirate BBC Essex on Friday 16th April. You can see his photographs on page two of our report. 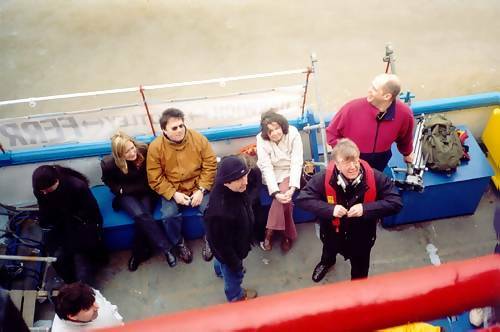 In 2006 BBC Radio York paid its own tribute to offshore radio by broadcasting a couple of shows from a pleasure boat. There are pictures here. Pirate BBC Essex returned to the air for a further six days of programmes in August 2007 (pictures here) and at Easter 2009 (here). 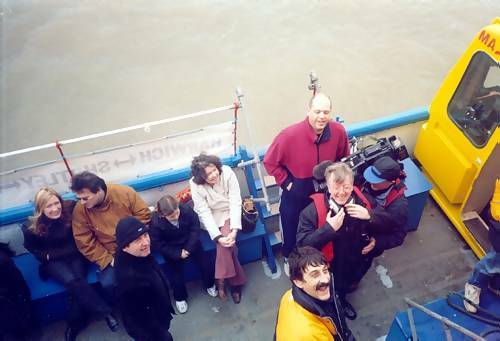 October 2004: In the annual Frank Gillard Awards, given to the best BBC local radio programmes of the year, Ray Clark won a gold for his documentary about the pirates, All At Sea, and the team from Pirate BBC Essex won a bronze award for Best Outside Broadcast. There are pictures from the award ceremony here. Congratulations to Ray, Tim Gillett, Steve Scruton and the rest of the guys for providing a wonderful fortieth anniversary celebration for offshore radio and on winning these well-deserved honours.